UPDATE: It appears that Yahoo's email system is working again. According to user's complaints on social media, Yahoo's email system is not working and has been down since at least 11:30 a.m. Eastern Standard Time on Friday, October 25, 2013. 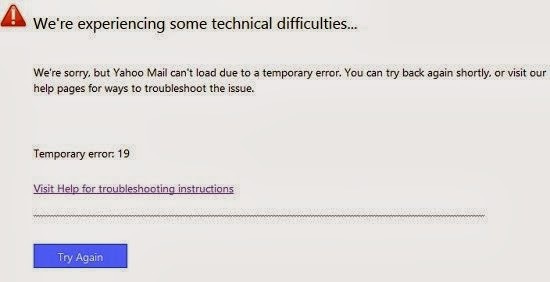 We’re sorry, but Yahoo Mail can't load due to a temporary error. You can try back again shortly, or visit our help pages for ways to troubleshoot the issue. Visit Help for troubleshooting instructions"
As of the writing this news article, the Yahoo and Ymail Team accounts on Twitter have not issued any reason for the Yahoo email login trouble.